On the evening of 5th December 1941, Franklin Delano Roosevelt, the President of the United States, received a message intercepted by the US Navy. Sent from Tokyo to the Japanese embassy in Washington, the message was encrypted in the top-level Japanese ‘purple code,’ but that was no problem, the Americans had cracked the code long before that. It was imperative that the President should see the message immediately because it revealed that the Japanese, under the heavy pressure of US economic sanctions, were terminating relations with the United States. Roosevelt read the thirteen-part transmission, looked up and announced, “This means war.” He then did a very strange thing for a President in his situation… absolutely nothing. On 6th December 1941, at a Cabinet meeting, Secretary of the Navy Frank Knox said, “Well, you know Mr. President, we know where the Japanese fleet is.” “Yes, I know,” replied FDR, “I think we ought to tell everybody just how ticklish this situation is. We have information… Well, you tell them what it is, Frank,” said FDR. Knox became very excited and said, “Well, we have very secret information that the Japanese fleet is out at sea. Our information is…” and then the scowling FDR cut him short. 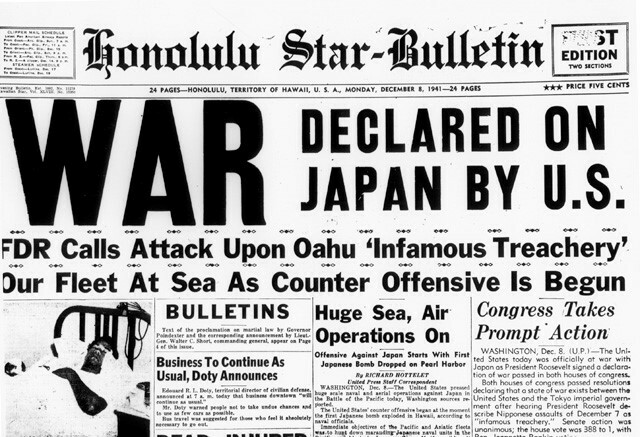 The very next day, Pearl Harbor was attacked and the rest, as they say, ‘is history.’ Well, maybe. At the time of the attack on Pearl Harbor, the US was decrypting a thousand pages per day of coded Japanese communication. 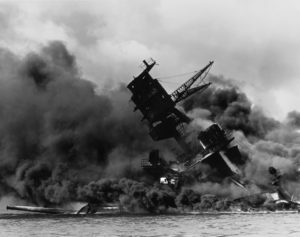 Following the attack, the US government maintained that there was no indication of an impending attack but the government however, still classified much of it as secret and denied access to many of the intercepted messages, to the string of enquiries which was attempting to investigate the truth behind the Pearl Harbor incident, over the years. Much of the decrypted traffic is still classified, more than seventy years after the event. 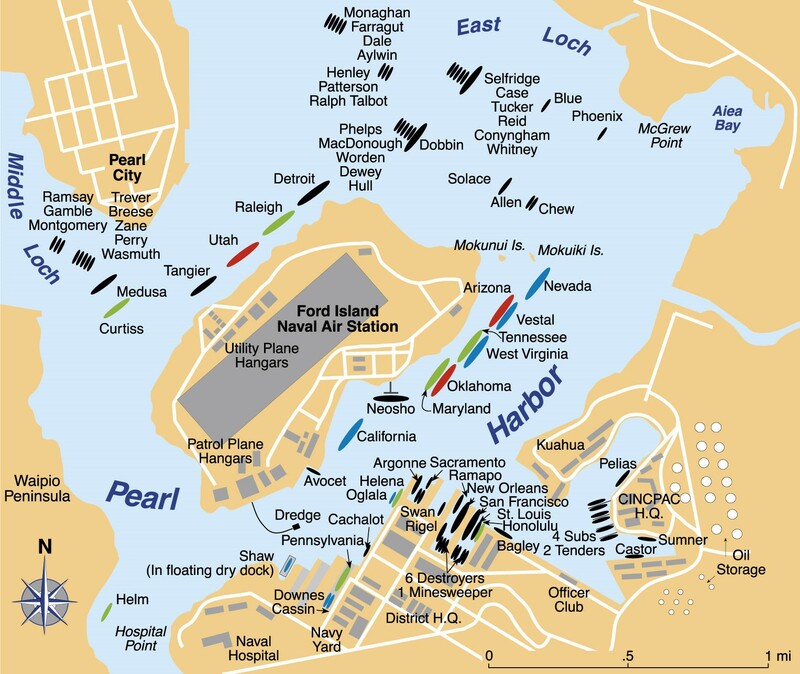 The larger vessels on ‘Battleship Row’ in Pearl Harbor could not have been located more conveniently for the Japanese pilots, if they had arranged them themselves. Ignorance was no excuse. The US Navy was very much aware of the devastating success of carrier-borne aircraft against battleships in harbour. A few months earlier the British had destroyed almost the entire Italian battle fleet in a single action in Taranto harbour, Italy, using planes carrying torpedoes modified for shallow water and bombs from aircraft carriers, two hundred miles away. In view of this and the obvious lessons to be learned from it, and the fact that war with Japan was already being provoked, it is difficult to draw any conclusion other than that the American ships in Pearl Harbor were deliberately arranged as ‘sitting ducks’ in order to ensure that the Japanese attack became the stunning success it certainly was. At the time of the attack, the ships were left completely vulnerable, with watertight doors and ammunition lockers open and the three more modern aircraft carriers based at Pearl Harbor, the real power and future of the Pacific fleet, were safely away at sea. The ships sunk at Pearl Harbor were, for the most part, obsolete World War One-era types and of greatly diminished military value. Only one of the battleships, the Nevada, was capable of moving under its own power. In spite of all the warnings and the great likelihood of an attack, anti-aircraft weapons were unmanned, ammunition was locked-away, anti-submarine measures were not implemented, combat air patrols were not flying and scouting aircraft were nowhere to be seen. Newly available, long-range patrol aircraft were not supplied to Pearl Harbor and aircraft were lined up on the ground in convenient, neat, adjacent rows, almost impossible for the Japanese to miss. Does any of this sound even vaguely familiar, perchance, in relation to a slightly more recent ‘attack’ on the US? 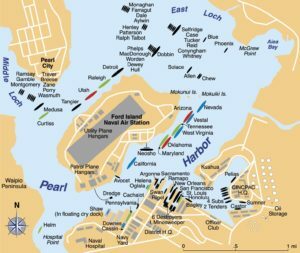 Japan began planning the attack on Pearl Harbor as early as January 1941 as a precaution in the event of the political situation escalating to a war footing and finally, on 26th November 1941 a fleet including 6 aircraft carriers with 423 aircraft aboard, 17 other war ships, 8 oilers, 30 submarines, and 5 midget submarines left Hitokappu Bay in the Kuril Islands of Northern Japan, for Oahu. 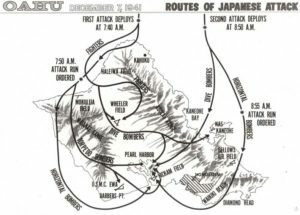 The sneak attack was pre-planned to occur early on Sunday morning, 7th December 1941, with the main intent of knocking out the US Pacific fleet. However, history has proven that this apparently successful attack was in reality the undoing of the Japanese Empire’s desire for Pacific and Asian dominance. Japan’s first wave of 183 aircraft, both fighters and bombers, was launched from six aircraft carriers 230 miles north of Oahu at 6.20 am. The plan was obviously to disable the US ability to get fighters in the air, in response to the aggression and the first wave included a destructive collection of aircraft, including 40 torpedo bombers, 51 dive bombers, 50 high altitude bombers and 43 Zero fighters. A warning of the coming attack occurred as the USS Ward destroyed an incoming Japanese midget submarine and a second warning came at 7.02 am when Army radar operators at Kahuku Point detected a large formation of planes coming from the north on their radar screen, but mistakenly believed it to be American B-17 bombers heading-in from California. The second wave involved an additional 167 fighters and bombers, which delivered another heavy bombardment to all of the same targets, striking ships, aircraft, buildings and personnel whilst they were still desperately trying to recover from the first round of bombings. At 7.40 am, at this time over Kahuku Point, Japanese Commanding Pilot Lt. Commander Mitsuo Fuchida, the leader of the first wave, signalled the attack to begin and as pre-arranged, the 183 planes of the first wave broke formation. Dive bombers headed upwards to 12,000ft, horizontal bombers to 3,500ft and torpedo bombers plunged to sea level then into mountain passes to avoid detection as they headed for their targets. Fuchida then radioed his carriers the now famous command, “Tora! Tora! Tora!” as his aircraft rounded Barbers Point and headed towards Pearl Harbor. Their primary target was Battleship Row. The Air Stations of Oahu were also bombed and strafed simultaneously at the outset of the Japanese raid. 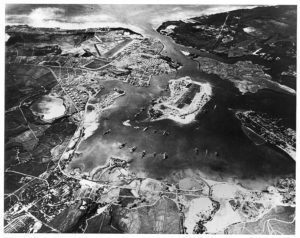 This included Air Stations at Ford Island, Kaneohe, Wheeler Field, Ewa, and Hickam plus Bellows Army Air Field and the Marine Air Base at Ewa. This almost eliminated US air response capabilities for the entire duration of the attack on Pearl Harbor. USS Nevada attempted to escape to the open Ocean but her Captain had to beach her to prevent her sinking in the harbour channel and blocking it. The vessel had been struck by one torpedo at mooring and five 250kg bombs along the way. Tugs helped her across the channel where she was beached off the Waipio Peninsula and one year later the repaired ship re-joined the Fleet, and went on to take part in the Normandy invasion, the invasion of Southern France, and the Battle of Okinawa. Within minutes of the first wave attack, the battleships, Arizona, Utah, California, Oklahoma, West Virginia, and Nevada were essentially sunk, and Maryland, Tennessee and Pennsylvania were badly damaged by torpedoes and bombs. USS Arizona was the most badly damaged of all of the ships attacked. A 1756lb bomb detonated near the forward munitions magazine, resulting in an incredible explosion that destroyed the front half of the ship, and caused it to sink in nine minutes, resulting in 1177 deaths and only 377 survivors. The unsalvageable ship was left on the bottom of the harbour and remains there to this day as a ghoulish tourist attraction and more importantly, the tomb of all the sadly-deceased crewmen. As the second wave’s attack was completed, Commander Fuchida signalled a return to the carriers. 21 vessels had been damaged or destroyed, and most of the aircraft on Oahu’s airfields were destroyed. By noon, all but 29 of the Japanese aircraft had returned to their carriers and Japanese commander, Admiral Chiuchi Nagumo, felt the mission was now successfully accomplished. Fearing reprisals from American aircraft carriers, now suspiciously out at sea somewhere, the planned third wave attack was cancelled and thus despite US claims to the contrary, Japanese naval and air forces had actually failed to destroy America’s Pacific Fleet. Personnel casualties included 218 US Army personnel killed in action, and 364 wounded. The Navy lost 2,008 servicemen killed, and 710 wounded and the US Marines lost 109 killed in action, and 69 were wounded. Civilians were also impacted by the attack, including 68 killed and 35 wounded. The total casualty-count was 3581 killed and wounded. Japan lost 29 aircraft and five midget submarines, and suffered 65 killed and wounded. Of course, the intelligence regarding the Japanese intent to attack Hawaii, never reached the people who really needed to hear it the most, Admiral Husband Kimmel, Commander in Chief of the United States Pacific Fleet at Pearl Harbor Hawaii, and the unit’s commanding general, Walter Short. It was common military knowledge that Pearl Harbor was where the Japanese would strike, if anywhere and the ‘surprise’ attack was just that, a complete surprise to Kimmel and Short and all the American servicemen and civilians who died. It was however, not a surprise to FDR, Generals George C. Marshall, Leonard T. Gerow, Admirals Harold R. Stark and Richmond Kelly Turner. They were the military’s ‘top brass’ in Washington and the only officers authorised to forward such sensitive intelligence to outlying commanders. But the decoded war declaration was deliberately prevented from reaching Kimmel and Short until after the attack. Internal army and navy inquiries in 1944, found Stark and Marshall in dereliction of duty for keeping the Hawaiian commanders in the dark, but the military successfully buried those findings. There were altogether, eight investigations of the Pearl Harbor incident. The most spectacular was a joint House-Senate probe that reiterated the Roberts Commission findings. At those hearings, Marshall and Stark testified, incredibly, that they ‘could not remember’ where they were the night the war declaration was received but a close friend of Frank Knox, the secretary of the Navy, later revealed that Knox, Stark, and Marshall spent most of that night in the White House with Roosevelt, awaiting the bombing of Pearl Harbor and relishing the chance for America to join World War II. From there, a further, widespread cover-up ensued. A few days after Pearl Harbor, historian John Toland reported that Marshall informed his senior officers, “Gentlemen, this goes to the grave with us.” General Short had once considered Marshall his friend, only to learn that the Chief of Staff was the one who had ‘framed’ him. Short later remarked that he pitied his former friend because Marshall was the only general who would not be able to write an autobiography. Indeed, of the multiplicity of warnings of the attack concealed from the commanders at Pearl Harbor, the ‘Winds Code’ was perhaps the most shocking. This was an earlier transmission, in a fake weather report broadcast on a Japanese short-wave station. It was simply “east wind, rain.” The Americans already knew that this was the Japanese code for war with the United States but the response of the senior US military was to deny that the message existed and to destroy all records of its being received. But it did in fact exist and it was received. US cryptography apart, the Australian intelligence service had also located the Japanese fleet heading for Hawaii, three days prior to the attack. A warning was immediately sent to Washington where the spin by Roosevelt was that it was a politically motivated rumour circulated by the Republicans. Also, a British double-agent, Dusko Popov, learned of the Japanese intentions and desperately tried to warn Washington too, to no avail. And there were several others. So why would Roosevelt and the senior military commanders sacrifice the US Pacific Fleet, not to mention thousands of servicemen’s lives – which of course was a deliberate act of treason, not to mention mass-murder? As previously related at length, they had concluded long before Pearl Harbor that they wanted to join in the war against the Axis powers and a ‘surprise,’ and ‘unprovoked’ attack (of which it was neither) on Pearl Harbor would surely convince American public opinion to accept a war they would have otherwise rejected. In addition Roosevelt would have a strong ‘get-out’ clause for reneging on his ‘no European war,’ empty promise. Roosevelt believed also, that provoking Japan into an attack on Hawaii was the only way that he could overcome the powerful ‘America First,’ non-interventionist movement led by aviation hero Charles Lindbergh. These anti-war views were shared by 80 percent of the American public from 1940 to 1941. Thus a small group of men, revered and held to be most honourable by millions, had convinced themselves that it was necessary to act dishonourably, commit treason, in effect murder in cold blood, thousands of fellow-Americans and incite a war that Japan had tried to avoid. All at the behest of that their ultimate masters – the Zionist banksters. 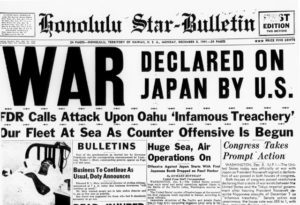 “Yesterday, December 7th, 1941 – a date which will live in infamy – the United States of America was suddenly and deliberately attacked by naval and air forces of the Empire of Japan.” FDR, 8th December 1941. Tens of thousands of patriotic American men, oblivious as to how these events were engineered by the banksters, blinded by patriotic fervour and propaganda and overcome by a sense of ‘duty,’ flocked to volunteer for military service. A few days after the attack on Pearl Harbor, Hitler allowed his personal dislike of Roosevelt to overcome his better judgement and made one of his greatest tactical errors and declared war on the United States, thus saving Roosevelt the time and trouble to do the same. When Germany and Italy fulfil their Tripartite Treaty obligation to Japan, by announcing that a state of war now existed between the Axis nations and the US, (though in reality, neither country had any way of actually attacking the US mainland) Congress then followed suit with additional war declarations upon Germany and Italy. 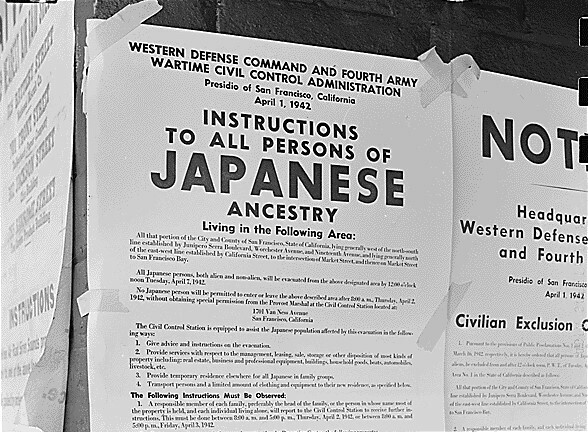 Then on the 19th February 1942 – FDR’s Executive Order 9066 condemned 110,000 Americans of Japanese ancestry to serve the rest of the war years in prison camps. Of those interned, 62% were actual American citizens. 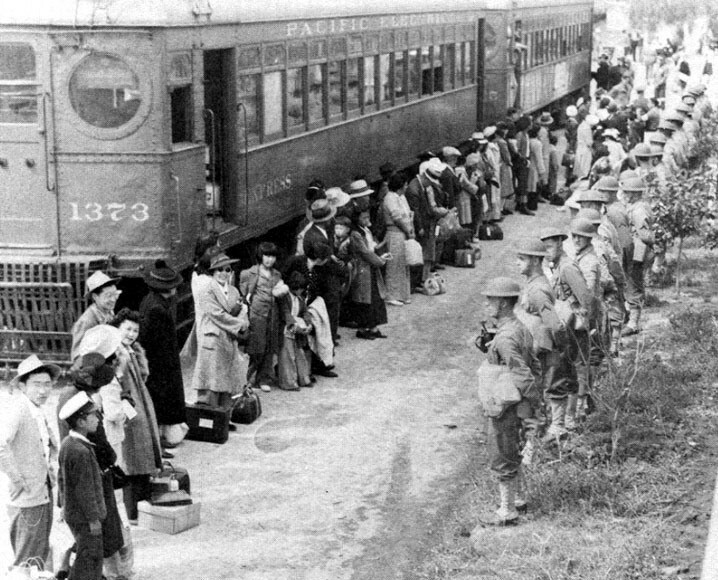 One hundred percent of all the Japanese-Americans in the state of California were interred, as well as many in Oregon, Washington, Arizona yet only about 1% of those in Hawaii. Two-thirds of the total, were American citizens and yet despite that, they unjustly lost their freedom and most of their property, all without due process of law and without having actually done anything wrong other than to be born of the wrong ethnicity. However, the FBI, unlike the President, the generals, the newspaper editors and the Supreme Court, were against the internment. They had already rounded up all the Japanese-Americans who may possibly present a threat, just as they had rounded up all the German and Italian-Americans who might be a threat too. 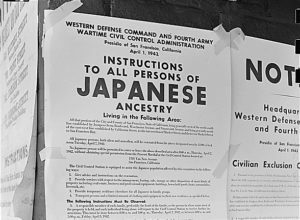 The FBI knew that apart from a few, isolated extremists, Japanese-Americans were not a danger. 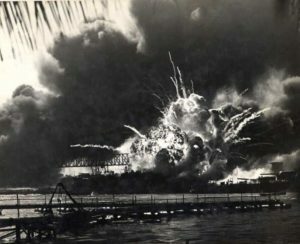 Pearl Harbor will always be remembered in the history books, the TV documentaries, as well as the majority of bankster-influenced and / or controlled websites, such as Wikipedia™, as the Japanese ‘surprise attack’ on the United States that resulted in America being dragged unwillingly and unavoidably into WWII. The idea and the documented fact that it was really engineered by the banksters, aided and abetted by the treasonous Zionists and covert Communist-sympathisers within the US and British governments as part of their long-term global plan still, more than seventy years later, has still not yet resulted in the public ‘waking-up’ to that very fact. 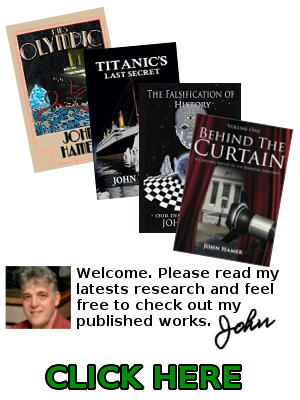 Even with both the declassification and leakage of WWII secrets, it still has taken a very long time for historians to re-examine Pearl Harbor and, what really adds ironic insult to all the treasonous betrayal and unnecessary, horrific death and injury in all this, is that the Japanese Navy could not have done the deed, without the prior help of the British Royal Navy. In 1918 the Japanese approached the Royal Navy with a view to obtaining information regarding the new British aircraft carriers. At the time Japan was a close ally of Britain, but nevertheless, the Admiralty refused. They wanted to keep their plans for this new technology secret. However, unfortunately for the Admiralty, the Air Ministry and the Foreign Office had different ideas and believed that here was a potential for large sums of money to be made. And so it was that William Forbes-Sempill was sent to Japan in 1920 to lead a civilian delegation to assist the Japanese with their aircraft carrier ambitions. This was successful and a huge boost for Japan, whose military now had a potential worldwide capability. This alarmed the US even at this point in history, and they voiced their concerns at the Washington Conference of 1922, eventually leading to the termination of the Anglo-Japanese alliance. However, the damage had now already been done and all Japan now needed was for their pilots to be trained in aircraft carrier techniques and tactics. Luckily enough for them, one Frederick Rutland made himself available. He had risen through the ranks to become a Squadron Leader and was one of the best carrier pilots in Britain. But, as recorded in an MI5 statement two decades later, Rutland believed in the hype that WWI had been the ‘war to end all wars’ and believing that war was a thing of the past, left the military and moved to Japan where he began work for the Japanese government, designing planes and training pilots. So, thanks to the help received from both Sempill and Rutland, Japan made rapid developments in naval aviation and by the 1930s had a carrier fleet equal to the Royal Navy. This in effect gave Japan the capability to wage war virtually anywhere and indeed in 1931 Japan’s war began when they invaded Chinese Manchuria. Britain’s response to this worrying development in the Pacific was to spend £50 million on turning her Pacific base of Singapore into the largest and most fortified naval base in the world. However, unfortunately for the British, it was discovered a year later that one of the Japanese spies operating in the area purchased plans of the new base from a British serviceman named Roberts, totally compromising British security in the region.